Household repairs can be a nuisance that drags on and on — either you're frantically researching qualified repair companies online, or going on YouTube to figure out how to repair it yourself. Then when you finally do decide you've almost got the job done, inevitably you realize that you don't have the tools you need to succeed. 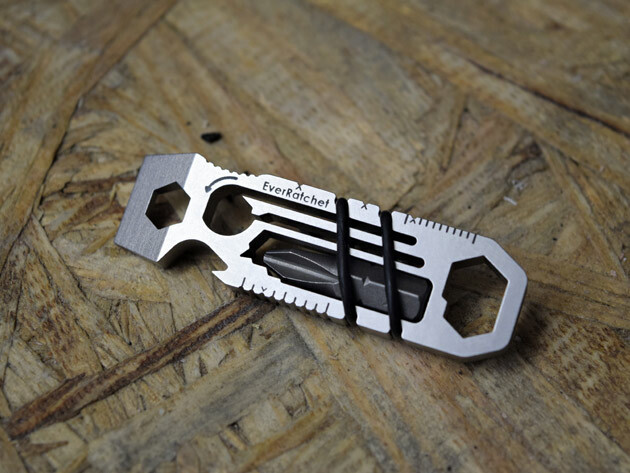 This EverRatchet Ratcheting Keychain Multi-Tool can make quick work of a wide variety of household fixes, so you don't have to go pick up a whole bunch of ad hoc tools you'll only use once — this single tool acts practically like an entire toolkit. The gadget includes seven wrenches, a bottle opener, a wire stripper, metric and imperial rulers, a box opener/scraper and wire stripper — it even comes with a custom-sized Flint2Go fire flint so you can start a fire fast. That makes it the perfect tool for moving, design jobs, camping and more. Plus, it's a one-size-fits-all tool that fits on your keychain, so you're ready to go in case a project suddenly comes up. Plus, intelligent design and patent pending of the ratchet keeps you from needing to lift and reposition the tool when working with limited visibility or space. Usually this EverRatchet Ratcheting Keychain Multi-Tool is $27.99, but you can get it here for $24.99.